Inclusion body myositis or IBM as it is commonly referred to, is a muscle disorder, which presents itself with age. As IBM is a disorder and not a disease, there is no cure as such and is inevitable for aged individuals. The onset of this disorder affects an individual’s normal motor functions as it attacks the individual’s muscles, tendons and ligaments. As the disorder strikes an individual at the internal level, it can often be missed. There have been numerous cases of the disorder being misdiagnosed, which often leads to complications in the long term. The disorder normally presents itself in individuals over the age of 60, however, there have been situations where the disorder has been affecting individuals as young as 40. This has been noticed over the last decade and can be attributed to the lifestyle being in play these days. Sedentary lifestyles, no proper sleep pattern, improper diet and so on often lead to muscle fatigue which eventually is a precursor for IBM in the long run and hence, affects younger individuals as well. There is no specific test which can identify IBM in an individual, however, a combination of tests such as Full blood count, Calcium and Phosphate, Creatine Kinase, Erythrocyte Sedimentation Rate and so on will be a good indicator of whether the disorder has set in or not. There are however a number of therapies which have helped in slowing down IBM. This however is something, which is not found to be true across the board for all individuals, and results tend to vary. As such, clinical trials are still ongoing by numerous companies, but nothing has been confirmed as of yet. In terms of which regions are affected the most by this, North America and Europe are affected the most as on date. A number of reasons could be responsible for this, some of which include the lifestyle being led as well as the climatic conditions where the cold could aid the early onset of this disorder. It is also for this reason that there is a high demand for numerous therapies in these regions for IBM. Following are just a few of the companies that are operating in the Inclusion body myositis Market. 10.2. 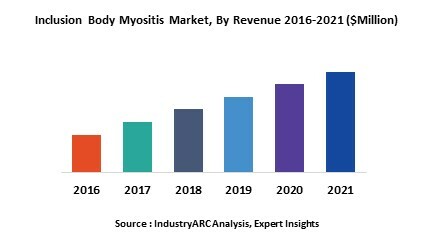 New Zealand Pharmaceuticals Ltd.
Table 29 " Inclusion Body Myositis Market By Type, Revenue & Volume, By Erythrocyte Sedimentation Rate, 2018-2023 ($)"